Landscapes are far from static. Maturing trees cast shade, shrubs elbow out companion perennials, and groundcovers, well, cover. If you’ve ever tried to stop time and fix a garden picture—or hurry it forward to maturity for that matter—you know only too well how arduous and ultimately futile the effort can be. The authors’ perspective—more cooperation, less dominion—is most welcome. What a relief it is to be encouraged to accommodate and welcome a garden’s ever-changing nature. The passage of time introduces mystery, excitement, and a sense of discovery—even in a small garden like mine. The book begins by reacquainting readers with natural systems long in place. 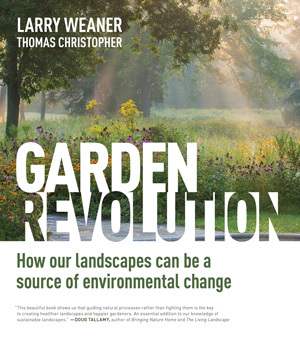 The book is in Weaner’s voice and in this section he pays respect to mentors, innovators, and adventuresome horticulturists bucking long-accepted past practices: biologists, nurserymen, landscape architects, ecologists, and climatologists. The following section adopts an approach that’s more design choreography than static landscape composition. Hardworking chapters deal with site analysis, integrating local ecology, and assembling a “synergistic” plant list. Spotlighting ephemeral moments like shifting light, seasonal bloom, the animation of birds and other wildlife, or blazing fall leaf color, are addressed as well. Focusing on these elements in addition to layout and plant placement invites the gardener, homeowner, and even casual visitors to the garden to savor each unique moment in the always-changing landscape.